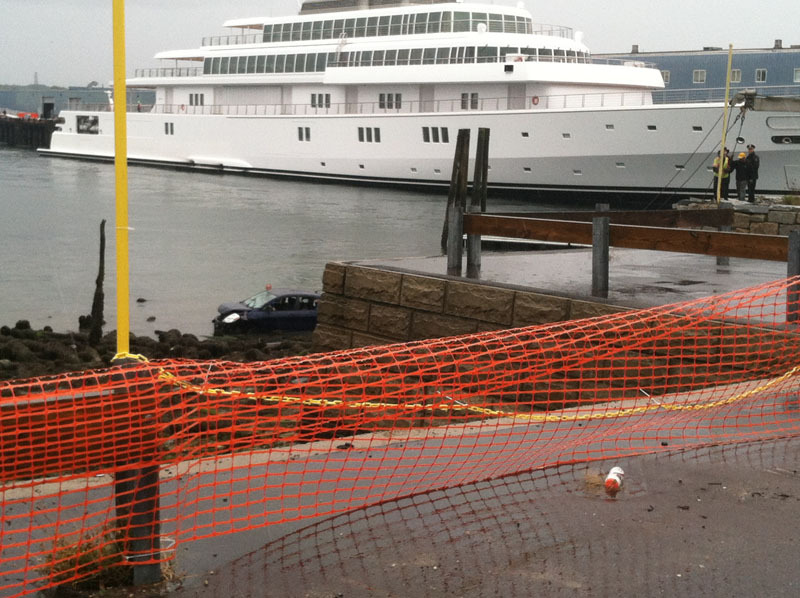 An 84-year-old woman is recovering after her car sped down India Street, plowed through two chain-link fences and a guardrail and plunged into Portland Harbor on Friday. 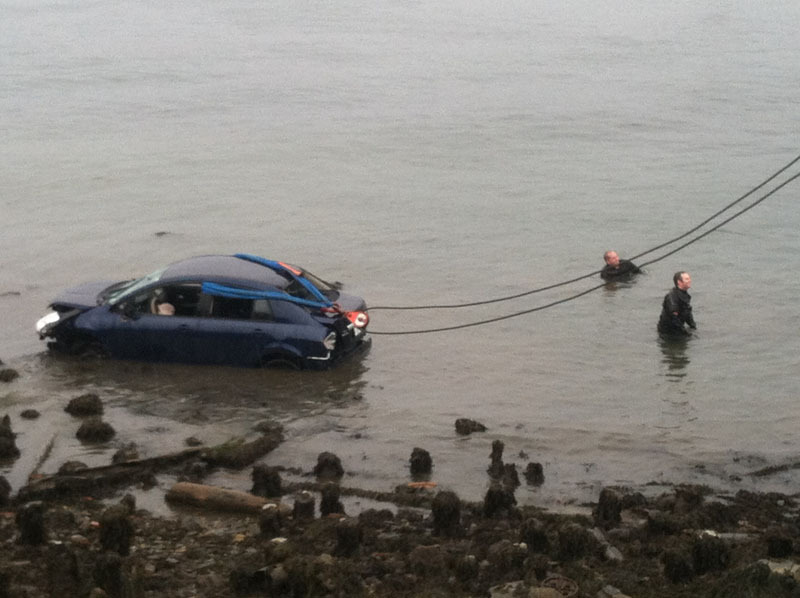 An 84-year-old Portland woman whose car plunged into Portland Harbor on Friday was rescued by a group of people who got her out of the vehicle before it sank. 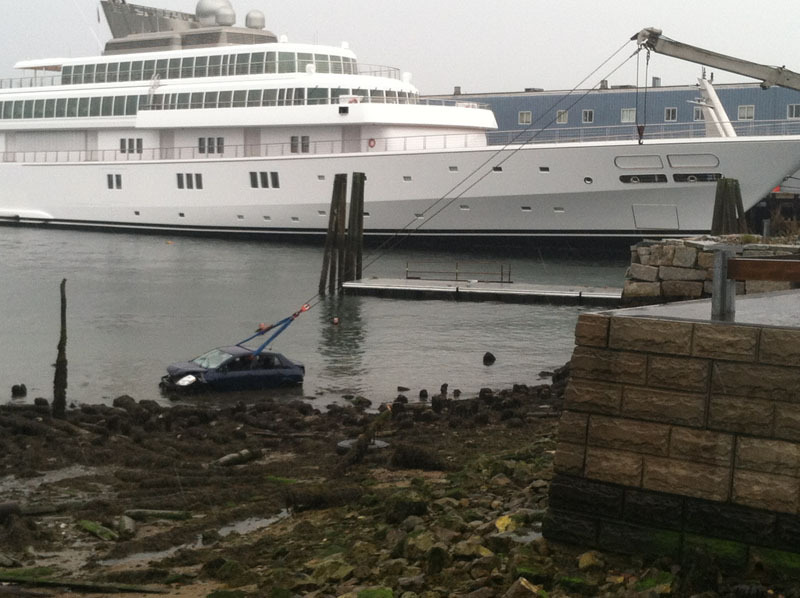 Ursula Nixon’s car sped down India Street and went through two chain link fences and a guardrail into the harbor about 1:20 p.m. Friday, three hours before low tide. Passers-by who saw the accident, as well as police and firefighters who were nearby, responded immediately. “You could hear the clanging of a fence,” said Michael Wells, who was on a break from his job at Auto Europe and was one of the civilians who helped in the rescue. Wells described a chaotic scene as close to 30 people came running from nearby businesses, yelling and scrambling down to the shore. Seven or eight went into the water, including him, he said. Two police officers who were at the Maine State Pier because a naval vessel was docked there ran to the scene and lowered themselves into the shallow water alongside the parking lot. Four or five civilians were already in the water, trying to get the woman out of the car. Firefighters who were training nearby got to the scene within 30 seconds, said Lt. Robert Slaving. Slaving donned a life jacket and was lowered to the water, then made his way out to the car. After Nixon was freed, he swam her back to the shore. Firefighters then put her in a basket and hoisted it up to the parking lot. “Her only worry when she got out of the water was did she hurt anybody,” Wells said. Nixon was taken by ambulance to Maine Medical Center, where she was listed in fair condition Friday night. 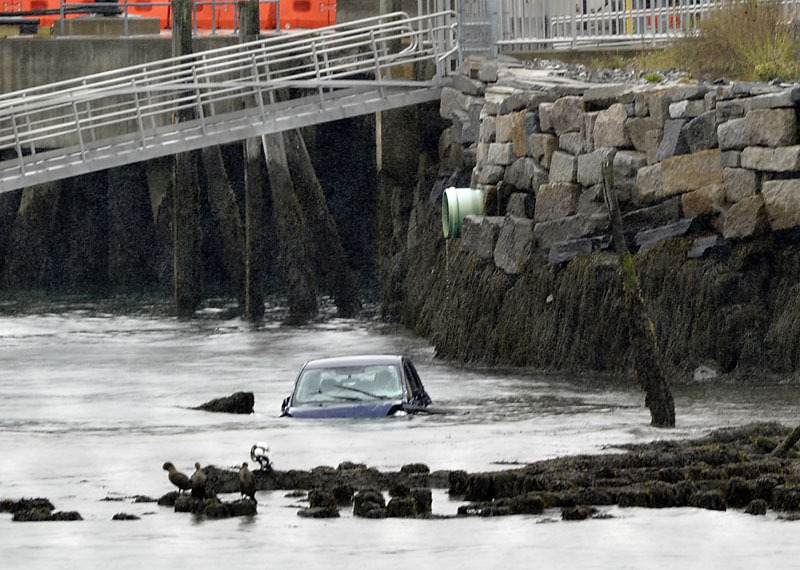 The car was about 30 feet from shore, although by the time it was hoisted out by a tow truck, the tide had receded and it was perched on rocks. Slaving said the people who responded and the placement of the emergency personnel saved the woman from more serious injuries. Nixon injured a femur and the bones around her eye, but she was grateful that she didn’t hurt anybody else, said her niece Mary Ledue-Paine, who came to the scene to retrieve her aunt’s glasses and pocketbook. Nobody else was injured, although some of the rescuers were treated for hypothermia, Slaving said. Ledue-Paine said her aunt has always been a cautious and safe driver, the one who brings her friends to their doctor’s appointments. She doesn’t drive after dark, Ledue-Paine said, and she’s very conscientious.